iQIYI is ready to dominate the music scene of 2019. This year, three major music competition programs is expected to dominate online viewership, all produced by iQIYI. The first is Idol Producer 2 <青春有你>, presented by Lay Zhang (张艺兴), a show that has 100 trainees compete against each other for a spot in a boy band. The first season produced Nine Percent, a nine-member boy band that also includes members Cai Xukun (蔡徐坤) and Fan Chengcheng (范丞丞). 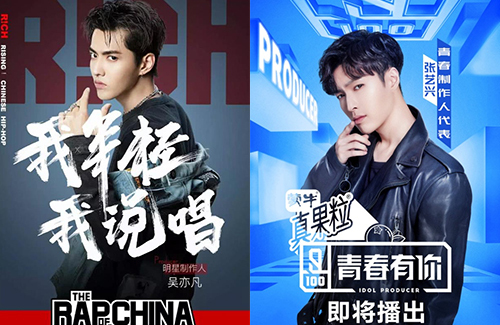 The third season of The Rap of China <中国新说唱>, presented by Kris Wu (吴亦凡), has already started recruitment notices for its 2019 summer comeback. The influential survival show is known for bringing rap into modern-day Chinese culture, and the trend phrases “Do you have freestyle?” and “skr” all came from Kris during his time as a coach in the program. To prepare for the show’s recruitment, iQIYI has created the program The Hedgehog Plan <刺猬计划> as a starter qualifying contest for The Rap of China. The Hedgehog Plan will recruit “young blood” rappers from colleges and universities for an opportunity to compete in The Rap of China. Since its inception in 2017, The Rap of China has kickstarted the careers of rappers PG One, GAI and AIR. In addition to Idol Producer and The Rap of China, a third singing competition that focuses on producing original singer-songwriters are also in the works. All three music competitions bring new genres to the table, targeting different audiences and tastes.